Solar Energy Technology is the one of fastest growing technology in the world. From having small scale niche applications a decade ago, it is becoming one of the mainstream sources of energy. However, because of lack of knowledge and training, many of us are unaware in best utilizing solar energy systems and this includes many solar product suppliers. This lack of knowledge is often on display in the form of wrongly oriented PV panels. As a result, the PV system output is greatly reduced. Poorly designed systems also increase the cost of installation. The FAQ session will help you identify the right products for yourself as our esteemed customers/ clients. Q. What are the basics of solar power? A. Learn about solar power inside out. Q. Is Solar a replacement for my UPS? A. We are energy conservation firm which provides Solar Energy solutions which are in no way replacement for ordinary UPS. UPS consumes 1.6 to 2.2 units of electricity to produce 1 unit of electric energy. It is banned in Germany and other European countries because of its counter productive nature. Our Solar Inverters would take free solar energy and convert it with an efficiency of over 86 per cent always. Q. How solar power systems interact with the utilities? A. Space required for large solar farms is abundant, combined with the increasing volatility and expense of fossil fuel and the need to reduce air pollution, solar energy growth will increase greatly in the coming years. 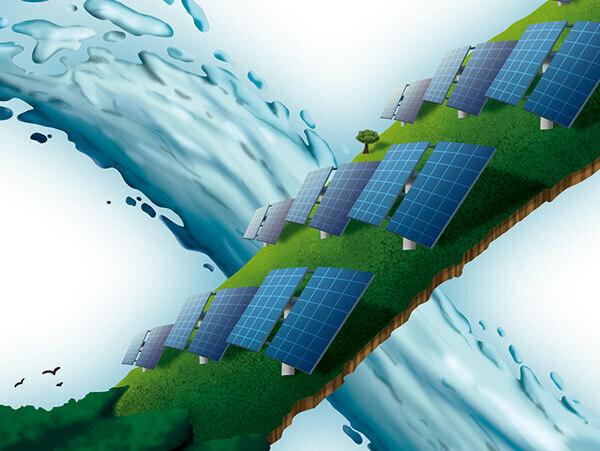 Solar energy is a rapidly growing source of renewable energy technology. There are three type of inverters: Off-grid, On-grid, Hybrid (with net metering) which explain interactions with the grid. The frequency of AC in Pakistan is 50 Hz. Q. How solar systems are sized (generally)? Q. What financing options may be available and generally how they work? A. We help our corporate clients acquire easy bank loans against specific load requirements. Q. What happens in cloudy days? SOLAR TECHNOLOGY IS FLOP!!! A. We tentatively over design for cloudy days with usually an expansion factor of 40 per cent. Q. What are simple ways to protect yourself if entering the solar market as a consumer? A. You should know how to select your components. After-sales is equally crucial. Q. Please tell me reason behind using poly Crystal panels. I had hear that mono panels are better? A. You have heard right. But if frugality is at the helm of affairs and you have ample space to mount the solar panels. Poly Crystalline is your choice. Q. You don’t add batteries. So we have to install this system without batteries? A. As you must have pointed out in the initial request, we foresee that you won’t be requiring any backup. We can add a regulatory backup accordingly. Q. I want to buy Volta Tubular battery 200Ah. Does it comes prefilled with electrolyte or you’ll add that at time of purchase? A. The ones we supply come with 14 hour dry charge. At Volta house, they receive 4 hour charge with electrolyte poured inside. Volta or Osaka battery price can be found here: Volta Battery. Q. Starting from a single 1.5 ton gree solar AC, specs, details, maintenance etc. till an entire house to be run on solar power? A. You are in the right place. We have a specific 1.5 Solar AC Package. For complete solution for entire house. Please seek a custom quote. Q. Damn this solar AC package is expensive! What is the pay back of Solar powered solution? A. It isn’t considering pay back and this is includes inverter based AC. If you have one, please less Rs. 60000/-. Q. How long did it take for the break even? Q. If in future, I want to upgrade, for example I want to run 2 AC’s (now 1 AC), which components I have to upgrade/replace? A. You won’t be requiring to change the inverter if you can regulate the load of both the air conditioners seperated with at least a 10 minute gap (& not at once). Definitely, there will be increase in number (hence Power Wattage) of Solar Modules. Q. Which company Inverter​ we are going to install for a 5kVA load equivalence? A. The inverter used here is an OEM from Voltronic with 4000W PV Panels input and not the generic 3000W standard inverter readily available in the market. Q. What is height​ of tilt structure? A. Generally, it will be a ground mounted GI Steel Structure (2 inches above the ground) with allowance for rainwater/accumulated water due to any other reason to flow beneath. Q. And if we connect Solar Panels directly to appliances…. will they work? A. First of all, only dc devices can run directly from them. It is recommended to apply the load through a some kind of protection. Systems installed without protection would get damaged. It is better to conserve the energy produced in some sort of battery using a solar charge controller. Q. I wanted to ask about the lowest unit for solar energy (couple of fans and lights). How much it will cost? and Nusret Fateh Ali Khan Ali Khan Solar Package. These are kits and installation charges are dealt separately. Q. I am building a house, and I would like to look into using solar power to run it. What is the best time I start worrying about it? A. Let’s discuss when you are close to completion of wiring. Q. I mean I have no idea how much the yearly expense on maintenance is? A. First 18 months are covered in free after sales. These high quality components especially the solar panels that we will install have performance guarantees against depreciation curves and reasonably extended fault replacement warranties. Apart from it there will be occasional checkup routines (optional through our Service Level Agreement) at a nominal cost so your interest is guarded with the promise and commitment we deliver. There is hardly any maintenance required and we provide 20-25 years of warranty on our solar panels. Q. What shall be the payment mode? A. Please note for the legal considerations, we need to get a deposit check or online deposit/transfer straight into company’s account. Q. What documents you will provide along with quotation? A. That is a post ordering question. The certifications will be made available on request. The conformance and Power Performace curves will be situated against warranties at the time of signing the contract for installation of the system. Q. Are there any regulations on Pakistan regarding the use of solar panels? A. Not typically until the client is intending to sell electricity back to Wapda and not adhering to quality conformance. Q. Why is there a need to have a regulatory backup? A. Regulatory backup is to bridge the energy demand supply gap. Q. What is typical cost per Watt for a 2 hour back up Solar AC Load System? A. Cost per norm is from Rs. 140 to Rs 160 per Watt for hi-quality AC Load systems. Q. Which solar panels do you use? What are important things to consider when choosing a solar energy solution? A. We have multiple options. In the end it all depends on availability in stock, payback and quality against budgetary considerations of the client. Q. If there isn’t a space inside our house for the batteries and inverter, could another empty container be used for that purpose? A. Yes we design special racks for this purpose. A. Yes mostly mono crystalline. Q. Are you importing solar panels? A. We are using locally manufactured Solar panels to cater for extended warranties. YOU CAN always grab local vendors from their neck. Q. Do you supply solar based water heaters? Q. I want to invest in this business. Do you accept investments? A. The answer to this question is partially yes and partially no. First of all, we allow you to decide among favorable options in which you can directly invest and become a part of this sharing economy. Else, we offer our franchises at a nominal flagship security which can be discussed right away. Q. What are the points of consideration for setting up a solar energy plant in Pakistan? A. We have one Solar Investment Plan. For this consultancy we charge a fair bit of consultation charges. Q. Where is your office situated? A. Currently, we are situated in four major cities: Lahore, Sialkot, Islamabad and Karachi. We commence our business through direct inquiries. Q. Is there any vacancy for Electrical Engineer? A. Please peruse Zorays Solar Careers. Can you identify air cooler water pump price in Pakistan?